*IMPORTANT NOTE! The PayPal Express Checkout integration uses the "Reference Transactions" mechanism of your PayPal account. Approval from PayPal is required to enable reference transactions for your live account. 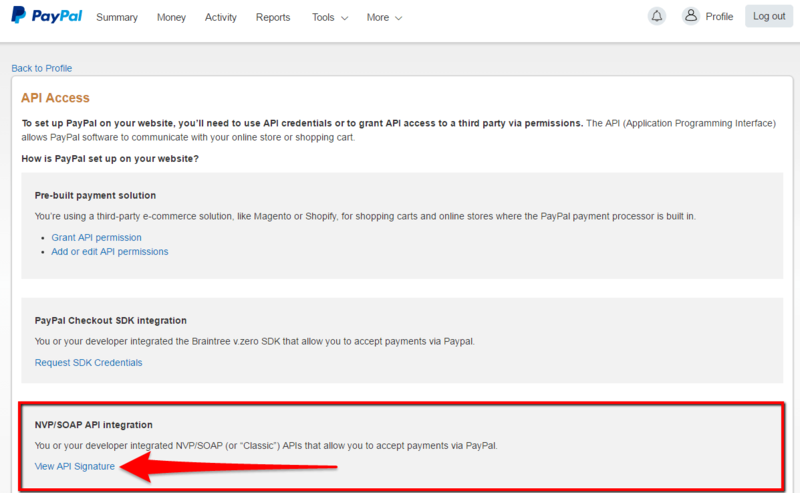 You must have admin permissions of your PayPal account to perform these steps. Merchant Technical Support will not enable reference transactions, you must contact PayPal Customer Support to enable this feature. 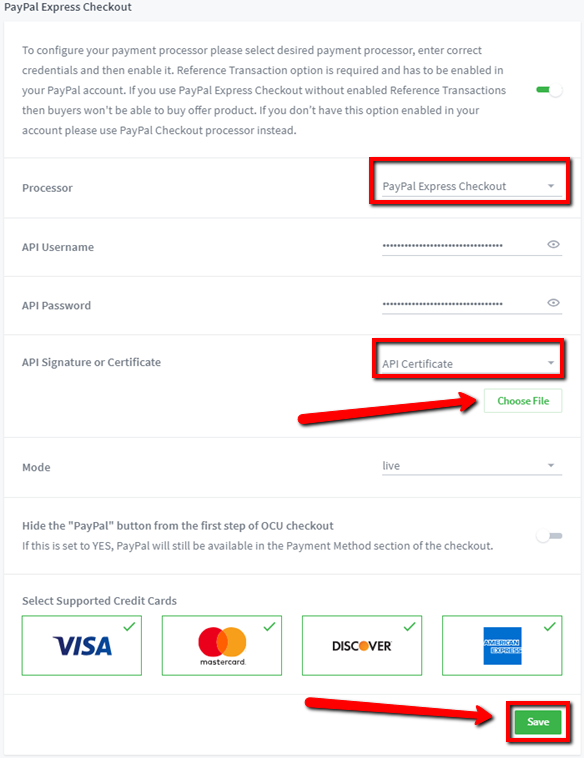 IF YOU DO NOT COMPLETE THIS STEP, THE PAYPAL EXPRESS CHECKOUT INTEGRATION FOR OCU WILL NOT WORK! Note: You need to already have PayPal Express Checkout enabled in your Shopify store first. This can be added at the Settings > Payments section of your Shopify admin. 3. Click "My selling tools" from the left-side menu -> Click the "Update" link for the API access. 4. Click the "View API Signature" link in the NVP/SOAP API integration section to get your credentials. 5. Click the "Show" link next to the API credentials that you want to use and copy them from there. How do I request API Signature or Certificate credentials? 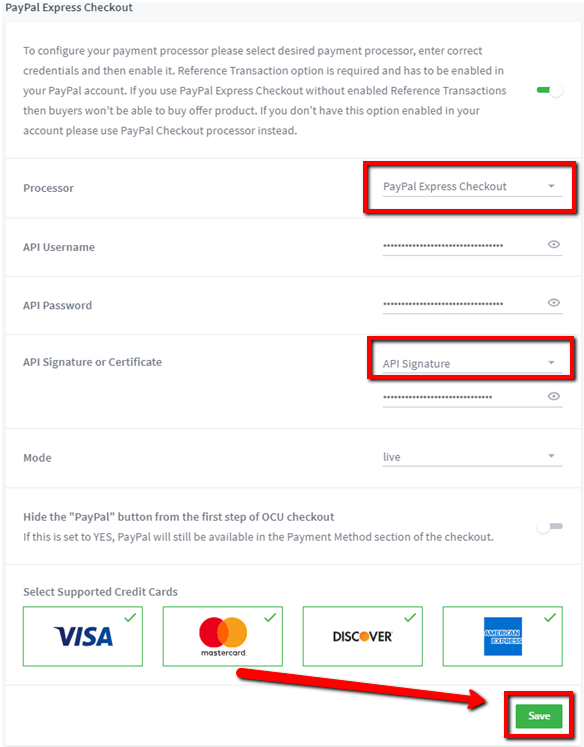 Copy and paste the API Signature information into the PayPal Express Checkout tab in the Payments > PayPal Express Checkout section of the OneClickUpsell app. Check to make sure that there are no extra spaces in the API credentials you enter. Check that you are using the API username and password and not your PayPal account username and password. The PayPal button can be hidden from the first step of the OCU checkout using this setting. You may want to do that if you're doing a Free + Shipping model for example. Or if you think your customer demographic would prefer not having the PayPal button there. If you'd like to hide the PayPal button from the first step of OCU checkout, just click the switch to the "On" position and "Save". *Note: If you enable this setting, PayPal will still be an available option at the "Payment Method" step of checkout which is the last step. 1. Refunds for OCU orders is a two-step process. You will have to process any refunds in your PayPal account first (to refund the $ to the customer) then in the Shopify Orders section (to make the reporting/inventory accurate). Click here for the information on processing refunds correctly. 2. If your theme has the PayPal button on the Cart page of your store and you customer clicks the button there, the OCU checkout will not be used even if you've enabled our integration. That's it, you're done! The PayPal button will now be hidden on the Cart page and will be shown on the Shopify and OCU checkout pages instead. This will ensure that your customers will use the OCU checkout for your trigger products. *Note: The steps above apply to most standard themes. If your theme's cart.liquid file doesn't have the mentioned code, then we recommend to use an app instead. 3. When a customer uses the PayPal Express payment option and also uses a discount at checkout, the PayPal invoice will not show the initial order's product description. This is to prevent inaccuracies in the total price shown on the invoice sent by PayPal. The standard Order Confirmation email sent by Shopify will still be sent with the total order details, including the initial order's product description. 4. The customer is required to login to their PayPal account to pay for the order using this integration. They won't be able to checkout as a guest by using a debit/credit card from the PayPal popup window.